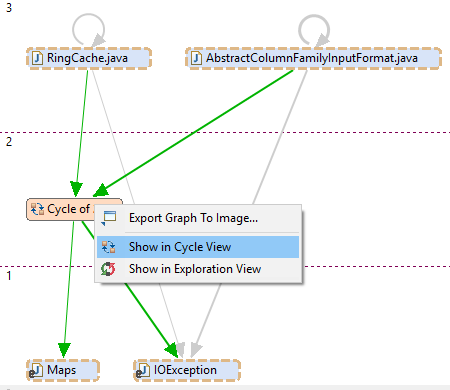 The Graph view can also be opened for an arbitrary selection of elements from the context menu. It shows the selected elements in a levelized graph. For more details about the advantages see Section 7.10.3.1, “ Levels ”. Again, existing parser dependencies can be analyzed using the Parser Dependencies Views. Like the Exploration view, the Graph view also offers focus and unfocus interactions to check the dependencies of an arbitrary selection of elements inside the view. It also offers highlighting and zooming to help in the analysis of the currently displayed content. Additionally, it will automatically group elements that form cycles to make the graphs more comprehensible. By right-clicking on a Cycle Group, it is possible to open the Cycle view to observe the detail of the elements that make part of it. Further details are explained in Section 7.9.2, “ Inspecting Cyclic Elements ”.